Steven P. Seidel, M.D., a plastic surgeon in private practice in Cullman, Alabama, is the director of Seidel Plastic Surgery, a free-standing cosmetic surgery clinic, which he established in 1996. 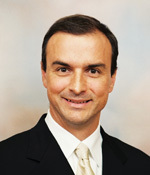 He also serves as Chief of Staff at Cullman Regional Medical Center . Dr. Seidel graduated phi beta kappa from the University of Wisconsin-Madison with degrees in biochemistry and German literature. He completed a residency in general surgery at the University of Michigan and a plastic surgery fellowship at the University of Alabama-Birmingham. Dr. Seidel holds board certification in general surgery as well as plastic surgery. Dr. Seidel specializes in all major areas of cosmetic surgery with an emphasis on breast augmentation, body contouring, and endoscopic surgery. He has published numerous book chapters and scientific articles. He lives with his wife, Bethany, and three children in the Cullman area. “My job is fascinating, in part, because every patient is different. Excellence in cosmetic surgery requires attention to detail and knowing your patients. Patients sense and appreciate that level of dedication and personal interest in them.”—Steven P. Seidel, M.D.